Are the Paris Floods due to climate changing for the worse? The flood of the River Seine is now past the 6.1m peak reached in the early hours of the early hours of Saturday 4th June. 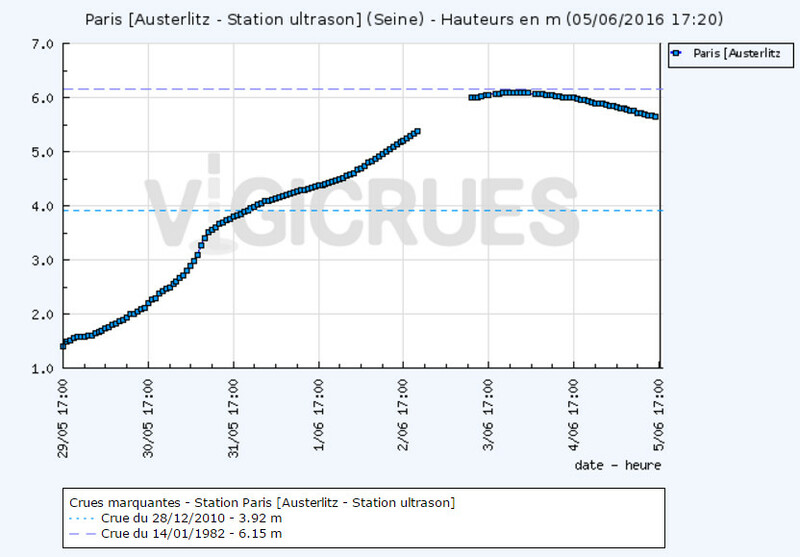 36 hours later, the official measurements at Pont d’Austerlitz show that the level is below 5.7m. The peak is was just below the previous major flood in 1982 of 6.15m, but well above the previous flood emergency in 2000, when waters peaked at 3.92m. Below is a snapshot of a continually-updated graphic at the Environment Ministry VIGICRUES site. Despite it being 16 years since this last emergency, the reaction of the authorities has been impressive. From giving people warnings of the rising levels; evacuating people; stopping all non-emergency vessels on the Seine; protecting those who live on the river; and putting into operation emergency procedures for the movement of art treasures out of basement storage in the Louvre.Without these measures the death toll and the estimated €600m cost of the flood would undoubtedly have been much higher. The question that must be asked is whether human-caused climate change has made flooding worse on a river that has flooded for centuries. The data is hard to come by. 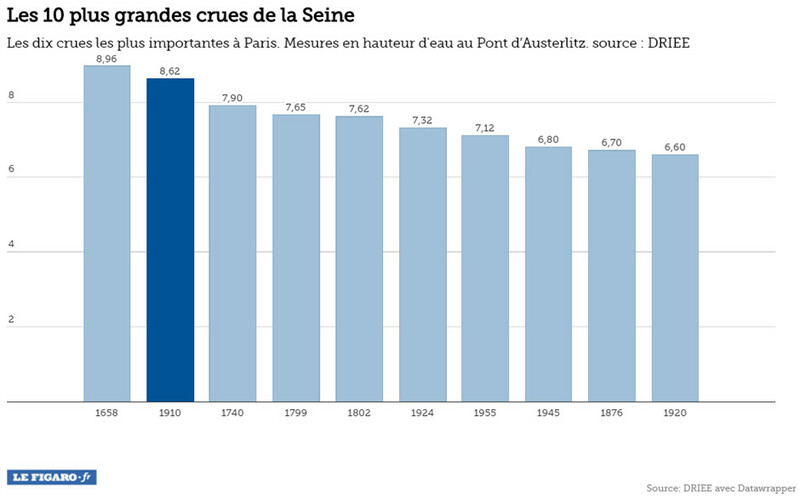 An article in Le Figaro last year gave the top ten record floods, the worst being in 1658. 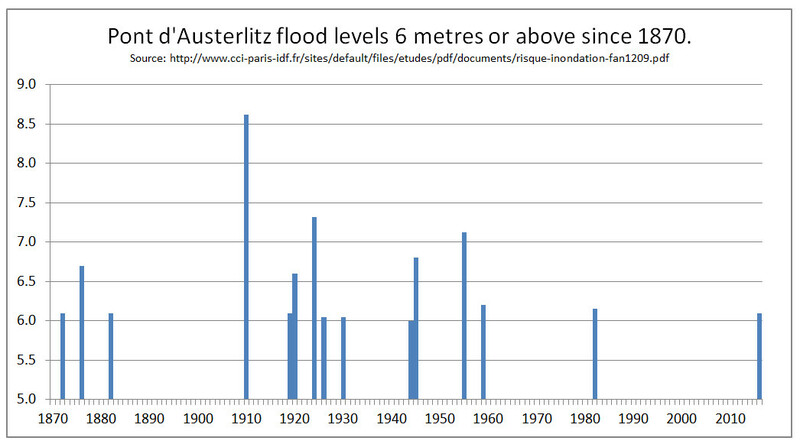 Although this is does show that the current high of 6.10m is a full 50cm below the tenth worst in 1920, there is no indication of increasing frequency. From a 2012 report Les entreprises face au risque inondation I have compiled a graphic of all flood maximums which were six metres or higher. Since 1910, the risk of a Seine River flood in the Ile-de-France region has been reduced in various stages by protective structures, including dams built upstream and river development starting in the 1920s, then in the 1950s up until the early 1990s. Major investments have been limited in the last decades, and it appears that protection levels are not up to the standards of many other comparable OECD countries, particularly in Europe. On the other hand, the exposure to the risk and the resulting vulnerability are accentuated by increasing urban density in the economic centre of France, as well as by the construction of a large number of areas activity centres and critical infrastructures (transport, energy, communications, water) along the Seine River. If the climate impact had become more severe, then one would expect the number of major floods to increase given the limited new measures to prevent them. However, the more substantial measures taken in the last century could explain the reduced frequency of major floods, though the lack of floods between 1882 and 1910 suggests that the early twentieth century could have been an unusually wet period. Without detailed weather records my guess is that it is a bit of both. Extreme rainfall has decreased, whilst flood prevention measures have also had some impact on flood levels.